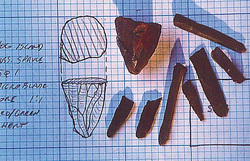 This picture shows how flint knapping, a process for making tools from stone that took a very skilled person to do, was used to create many different weapons. Analysis: The sharpness of the tools shows what the tool was used for. The sharper the tool, the bigger the animal killed, or the beastlier the animal killed, etc. 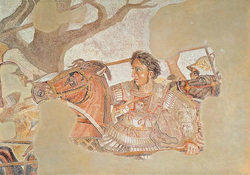 This mosaic of Alexander the Great was made by the Romans. Analysis (with help of MyHistoryLab): This would mean that the Romans were aware of the Greeks at the time of Alexander the Great (check timeline for dates), because they obviously admired him. They learned all they knew from him, obviously, because look at all the territory they conquered! They learned from his mistakes, because they always had the ability for someone else to take over. These are some examples of Greek coins. Analysis: Notice what is on the coins. If I'm not mistaken, those are Greek Gods. This shows what was most important to the Greeks. 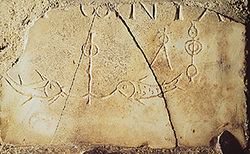 These are early Christian symbols found in Rome, which show the fish, still utilized today. 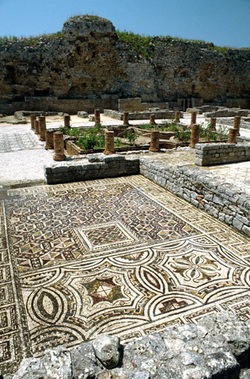 Analysis: This shows how the Romans had changed, and along with them, the Greek Byzatines. They were beginning to change from the mythological gods to Christianity, a transformation of social structure of sorts, because now it was socially acceptable to be a Christian. And even though the fish is still used today, it most certainly does not look like that illustration of a fish.